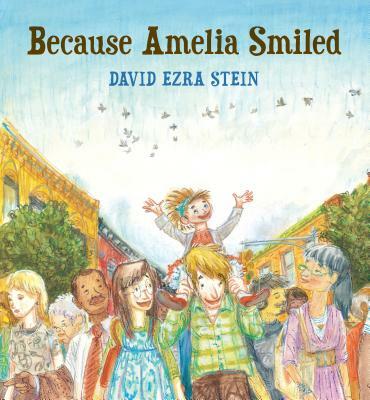 David Ezra Stein is the author-illustrator of Interrupting Chicken, which was awarded a Caldecott Honor. His previous books include Leaves, winner of an Ezra Jack Keats New Writer Award. He lives in Kew Gardens, New York. David Ezra Stein’s crayon art is playful and vivid. A playfully profound picture book that does its part in passing on good feelings. Realistic, heavily colored, and intensely detailed, the illustrations invite children to look closely and see the way people across the globe are connected: the smiles, the pets, the music. Certainly there’s a lot to discuss here, and some adults may want kids to make connections with their own actions, but this is also just a lovely way to look at life. A series of kindly acts comes full circle in this heartwarming, yet never saccharine story from Stein. . . . Stein’s spreads are dense with colored pencil and crayon lines and crammed with visual information. . . . Night and day, light and shadow, groups of old and young people spending time together: it’s a satisfying portrait of the feast of life. Even youngest children will grasp the idea that good deeds and positivity beget more of the same. Dynamic blends of crayon and watercolor create an impressionistic scene that still conveys eye-catching detail. The visual elements will capture readers’ attention, and the story offers valuable opportunities for discussion of how one person’s actions can influence events far beyond their own surroundings. Salutary good humor and a series of related events are both reliable picture book patterns; their up-to-date transmission here, however, is particularly effective, as are Stein’s cheerfully energetic illustrations in pencil, water-soluble crayon, and watercolor. His main characters are scruffy and fascinatingly individual, his settings are exuberant with color and light, and both are sure to elicit smiles in any kind of weather. Will nicely suit parents who hope to impart the value of pay-it-forward kindness to their children. Teems with cheer and vigor, the illustrations bursting to the sides of each spread and rushing with color all around. This book made me smile, it even made me get all misty-eyed from happiness, it darn well made me glad to be alive, and it made me want to stand on the corner and hand a copy to everyone I see.